Architect Dan Weber calls the Santa Barbara climate – where “it’s never hot, it’s never cold, there are no bugs, no wind, and it never rains” – pretty much perfect. So it stands to reason that his firm, Santa Barbara-based ANACAPA Architecture (which also has an office in Portland), makes the most of bringing together the indoors and the outside when designing homes for clients. Such is the case with the Crestline project, a former 1960s tract home in a neighborhood full of them. When Weber started working with a young couple with modernist sensibilities and a budget that was hardly unlimited, he envisioned a stunning renovation of the outdated home. And it all started with improving the connection between the indoor living spaces and the beautiful, oak tree-lined backyard. With the living room, kitchen, and dining room separated from each other, Weber envisioned a great room that could completely open up to the backyard using huge moving walls of glass from Western Window Systems. But it would take some surgery, he says. The result: Two floor-to-ceiling Series 600 Multi-Slide Doors running the length of two walls and meeting at a 90-degree angle when closed. When they are opened, the living room is totally open to the backyard, providing Weber’s clients with great views of the mountains, tons of natural light, and fresh Pacific air coursing through the home. And he also designed a complete outdoor living space with big outdoor kitchen, built-in barbecue, fire pit and wooden shade structure. So Weber and his team added 600 square feet to the master bedroom, with its 10-foot ceilings, and again added another set of floor-to-ceiling 90-degree Series 600 Multi-Slide Doors, these ones pocketing into the walls of the bedroom, providing a second seamless transition to the backyard. Weber also utilized various shapes and sizes of Western Window Systems windows throughout the home, as well. “In minimalist and modern design, we are always trying to get more glazing and less frame, and these are super-minimal and clean,” he says. Since its completion about four years ago, the single-level home has generated a bit of buzz for Weber and his firm, appearing on Dwell’s website and earning some ink in local publications. uploaded A Perfect Match through Add A Home. Indoor-outdoor living exemplified in Santa Barbara. One of two massive pocketing Series 600 Multi-Slide Door in the master suite increase the residents' living space. This view of the main living area from inside the master bedroom shows how two 90-degree multi-slide doors seamlessly blend the indoors with the outside. 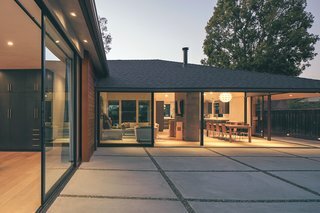 When open, the main living area's multi-slide doors let the perfect weather of Santa Barbara into the home. The flying cantilever provides a spectacular effect, says architect Dan Weber. When closed, the room's multi-slide doors meet at 90 degrees without a connecting post.